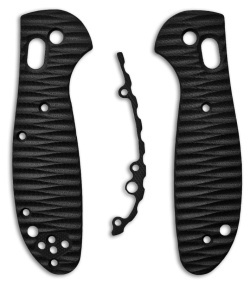 This replacement handle for the Benchmade Mini Griptilian is made by Allen Putman. It features black G-10 sides with a sculpted texture. Includes a black G-10 back spacer, and stainless steel clip screws. To view all the Benchmade Griptilian Knives in stock click HERE! Please Note: We will not warranty any broken or lost parts due to assembly/disassembly of the knife. This is NOT an official Benchmade product.